Noted Nepali litterateur B B (Birkha Bahadur) Muringla has been conferred the prestigious Bhanu Puraskar for 2016. Muringla received the award today at the state level Bhanu Jayanti celebrations held at Manan Kendra. Muringla, who hails from West Sikkim, was awarded the Bhanu Puraskar for his notable contribution to Nepali literature through a wide array of creative work. The award comprises a plaque, a shawl and a cash award of Rs25,000. 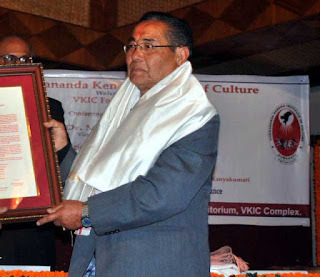 The Bhanu Puraskar is constituted each year by a committee formed under the Nepali Sahitya Parishad Sikkim and is awarded to an individual with outstanding contribution to Nepali art, literature and culture. The chief guest of the programme was state agriculture minister Somnath Poudyal, and also present were social justice minister Tulsi Devi Rai and a host of dignitaries. Five other individuals received the Sewa Shree Awards in recognition of their outstanding service in their respective fields. Govardhan Bastola received the Bhasa Shree Award, Anjali Pradhan was awarded the Sangeet Shree Award, B.B. Mukhia bagged the Natya Shree Award, while Mala Rana Patro and Kapilmani Adhikari were conferred the Patrakarita Shree Award. Minister Poudyal said the occasion offers an opportunity to introspect on the valuable knowledge left behind by Adikavi Bhanu Bhakta Acharya. He stressed on the importance of the Ramayana in today’s world and urged youngsters to accord the highest place to education. The minister released the Bhanu Smarika, a yearly publication of the Nepali Sahitya Parishad. Three other publications were also released on the occasion. Noted Nepali litterateur B B (Birkha Bahadhur) Muringla has been conferred the prestigious Bhanu Puraskar for 2016. Muringla received the award today at the state level Bhanu Jayanti celebrations held at Manan Kendra.